Hi everyone, I’m Jill and I write Everything Just So and I’m excited to contribute a guest post for Bella! Can we talk about her for a moment? Last September when I found out that she was attending the NYC IFB Conference and was literally staying around the corner from me in Brooklyn (what are the odds? ), I jumped at the chance to not only meet her but to introduce her to the F train we’d have to take to the pre-IFB Con cocktail party happening in Manhattan. It was raining. I was nervous. I arrived at the corner we agreed to meet on and when I saw her framed under her umbrella I thought: She is tall. She is glamorous. She is gorgeous! It took me about two seconds to learn she was something else—one of the most charming people you could ever meet. I am normally shy when it comes to meeting someone new but Bella put me at instant ease as we rode the train into the city and when we met up with all the lovely bloggers at the Mandarin Oriental I watched her work her magic in the room. It’s quite possible she met everybody there that night, each time I looked around for her she was chatting with a different person (please teach me this skill, Bella! ); she’s so friendly and giving of herself that you can’t help giving all that love right back to her. This essay is supposed to be about place and this is relevant when talking about Bella because what I learned about her when I met her is that she is living her motto—she blooms where she’s planted. Come back to Brooklyn anytime, Bella, we’d love to have you! Crowded on the weekends, the path to Grand Army plaza is gloriously empty on a Monday afternoon. Now, about Brooklyn. 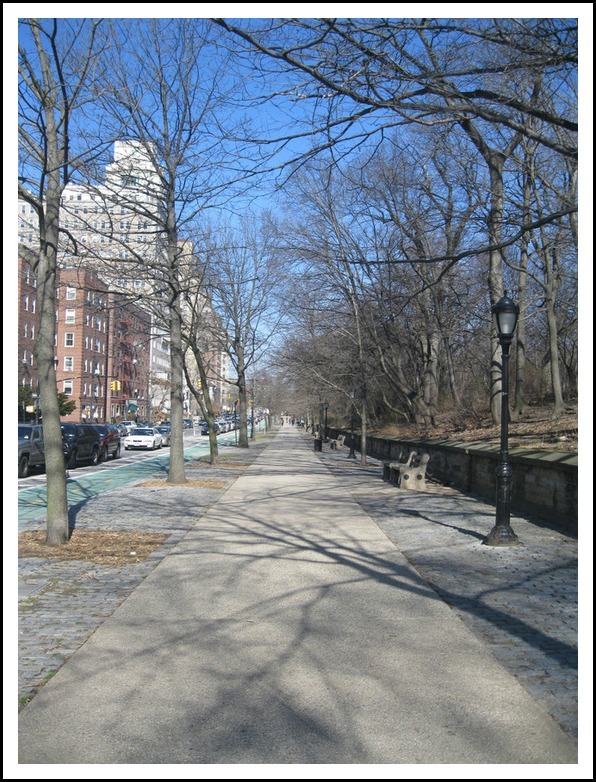 I live in the Park Slope section of that borough and one of my favorite walks is along Prospect Park West to Grand Army Plaza. These are some of the things I see along the way. Grand Army Plaza was designed in 1867 by Olmstead and Vaux. 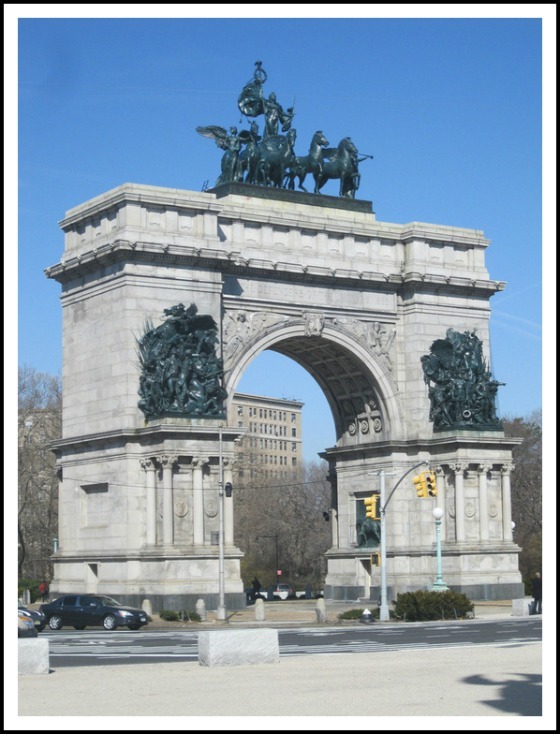 The Soliders’ and Sailors’ Arch, shown here, is inscribed “To the Defenders of the Union, 1861-1865” and was designed by John H. Duncan in 1888, while sculptor Frederick MacMonnies designed in 1894 the three bronze sculptural groupings that decorate the arch. I think of it as Brooklyn’s Arc de Triomphe. Isn't it so Napoleonic and wonderful? Actually, to be historically accurate, I should say, Isn't it so Arch of Septimius Severus? But then you might accuse me of being a history geek. 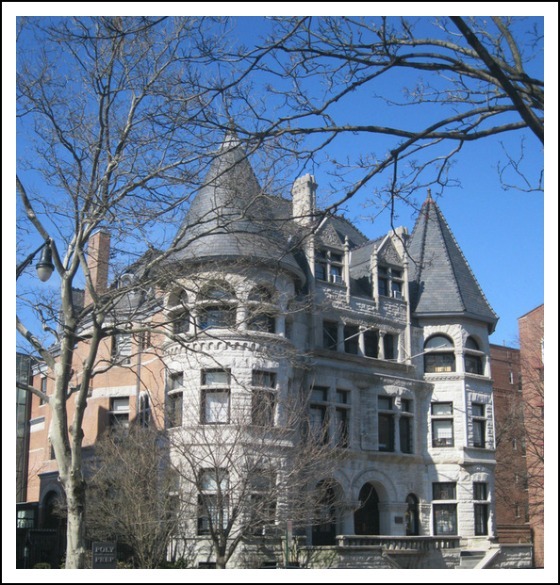 The mansions on the edge of Prospect Park West were built in the 1880s and 1890s when Prospect Park West was known as the Gold Coast. 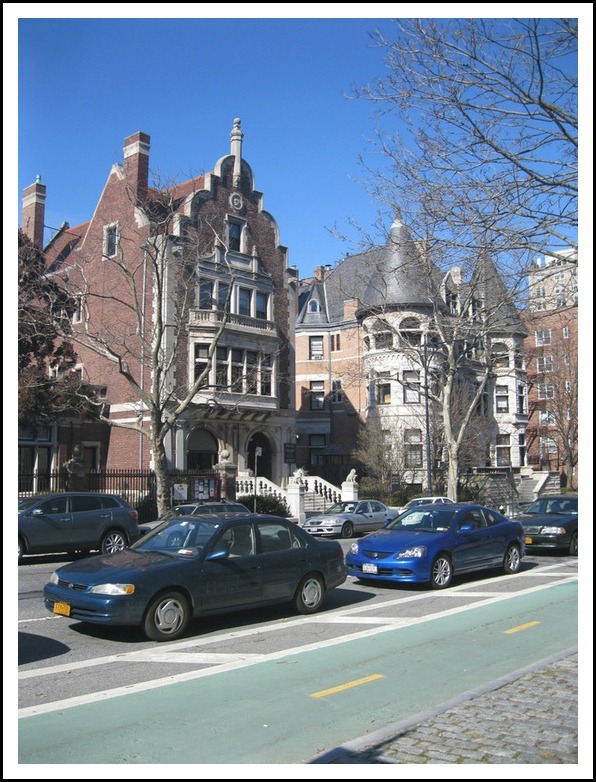 The mansion on the left is now the home of the Brooklyn Society of Ethical Culture. Beautiful architecture like this former mansion add to a sense of place in Brooklyn, New York. This gorgeous mansion is now Poly Prep, a private elementary school. I don't even want to know how much it costs to send a child here. My son goes to the very good public school down the street from our apartment. 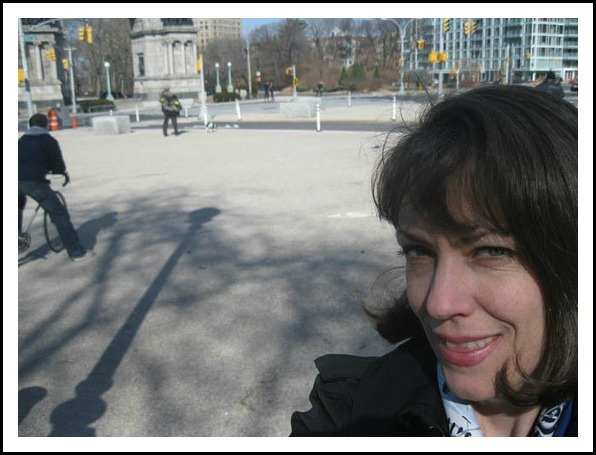 Jill Burgess, bloggeress of Everything Just So, shares her slice of Brooklyn with us. Here is your intrepid photographer in a self-portrait. I'd describe my style as classic, so with all this old school architecture around me, I feel right at home in a black trench and silk scarf. 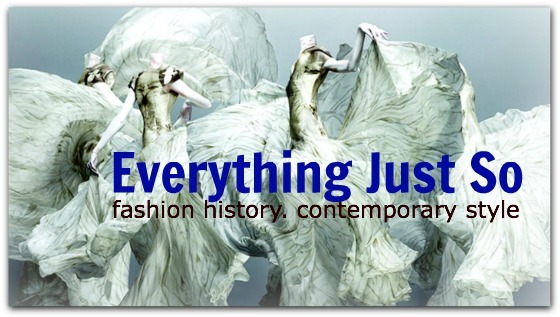 You can check out Jill's blog Everything Just So by clicking HERE. I was in Brooklyn last week - went to the Keith Haring exhibition at the Brooklyn Museum & had a walk through Prospect Park & around Park Slope. This is one of my favourite NY neighborhoods, my brother lives in Manhattan and whenever we're over (from the UK) I like to visit this area - it's good to get some history. Thank you. What a beautiful post Jill. I love the way you feel about Bella, and knowing you both in the distance I wish we could meet soon. I only know Manhattan, it is a real pleasure to know your favourite places in Brooklyn. Fingers crossed we will visit in Spring. Hi Jill! So you met Bella! I wish I could meet her in person one day too! i would love to meet Bella and Jill in NYC...how fun would that be!! Brooklyn is a such a great place--and Jill, you certainly live in one of the best parts. How fantastic to see more of your daily life! And what a great tribute to the friendship found via blogs. I certainly wish I were on that train with you! So cool to walk through Jill's neighborhood with her--she's taken her readers along on window shopping trips and to the museums too. And it was fun to see that her F2F impression of you is so much like the one I have you online. I believe everything Jill says about you! Your personality blooms from the pages. Hopefully I get to meet you one day as well....Lovely post Jill! I think I'm falling in love with Brooklyn thanks to Jill. How lucky is Jill to have met you! Great article, bella!!! That night in NY was so fun. I loved meeting both of you! Cool to see the Brooklyn snapshots. That's where I was born, believe it or not!